Friday January 23rd 1891 I was busy about the work all forenoon. Will took Mother to town in the afternoon. I put most of my spare time at the piano. weather pleasant again. Saturday January 24th 1891 I was busy all forenoon getting dinner and doing my baking. Will took me over to Fannys to spend the afternoon. Mother was there and did not come home she did not feel so well again today. Will went to town in the evening and I practiced. Mr Brown began boarding tonight. Sunday January 25th 1891 I was busy all the forenoon getting dinner. Agnes went home awhile in the afternoon. Will and I talked, read, and dressed clear for Sunday. Mother come home just before supper. Will and I went to church in the evening. Mr. Pratt preached a fine sermon. Monday January 26th 1891 It was a fine day. We got the washing done by eleven oclock. I went over to Woolfs a little while soon after dinner. Will took mem in the cart and then we went on to town to get things for Motnher. I knit and practiced in the evening. Tuesday January 27th 1891 We got the ironing done before noon. Lee came home last night. I was over in town part of the afternoon. Mother had a letter from Father and they decided to not start to Topeka till tomorrow. Wednesday January 28th 1891 I was busy most of the forenoon with the work. Mother went to town in a hack the middle of the afternoon. Will went out to Mr Harrison's sale and bought eight calves and three hogs. we walked over to Hatties to spend the evening. Mother and Lee started at ten oclock. 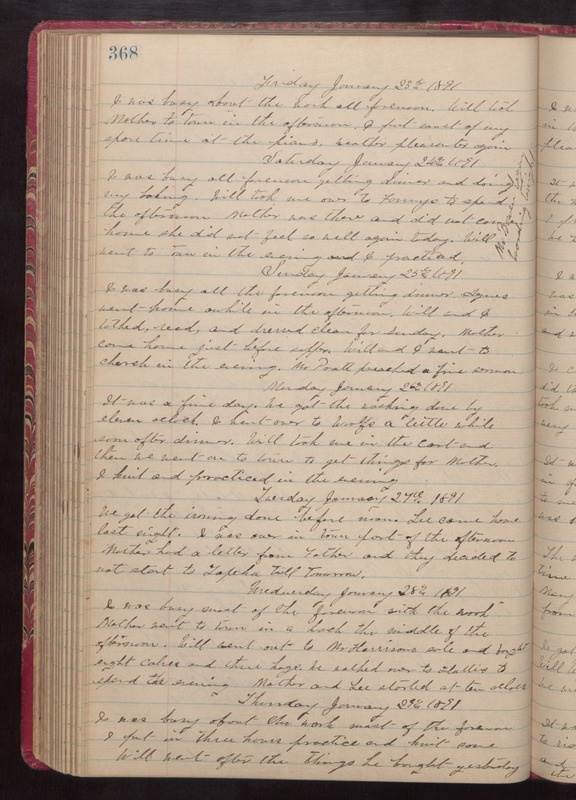 Thursday January 29th 1891 I was busy about the work most of the forenoon. I put in three hours practice and knit some. Will went after the things he bought yesterday.